Buy All-in-one Brother MFC-990CW with CISS and make 30 times more quality prints for the same money! Pay only 0.04 USD for A-4 full color print! 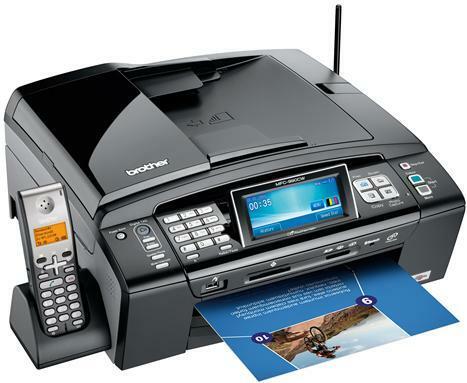 Usually the MFD abbreviation means so called "four-in-one" devices which combine printer, scanner, fax and copier. The new product of Brother Company, which is Brother MFC-990CW printer, beside those four functions can operate as a DECT-telephone and a digital answerback unit, which is sufficient. Surely, the Manufacturers could not neglect such a popular feature as Wi-Fi and Bluetooth operation, as well as the possibility to control the most of the functions by means of a big sensor display, which is the top of fashion now. As the MFC-990CW Brother inkjet printer takes the top position among the family of inkjet MFD's, it must have the respective exterior. Black color and smooth outlines make it look as an expensive machine. The approved tone decision emphasizes, that the device will not fit a crowded and busy office. It will much better look inside a quiet study or a home studio. Due to the Designers' decision to reduce glossy surfaces, the printer Brother MFC-990CW looks good enough, even after a long-term and not very careful operation. Although all the device functions can be operated and controlled by means the LCD sensor panel, which starts and sets up all the printer modes, there are a lot of additional control elements around the panel. Located to the left of the display is an ordinary number dialer, which is used for telephone and fax communication. More to the left there are digital answerback unit controls and printer ON/OFF buttons. Located to the right of the sensor display is a set of four buttons which provide the operation of the scanner, copier and PictBridge photo printer. The last two buttons to the right start document copying in color or black-and-white mode. Of course, this kind of multifunction device can be connected not only by means of USB or Ethernet. As well as other representatives of this class (the MFC-5895 Brother and MFC-J265W), the front panel of the MFC-990CW Brother printer locates inputs for connecting SD/MS/CF/xd flash cards as well as PictBridge port, Walk-and-print port combined with USB port for connecting flash cards and outer hard discs. In fact, the User, who does not want to retouch his photos, can print them directly from any carrier. Besides, the device uses Blue Tooth function, which enables printing from mobile telephones and other BT-compatible devices. In order to provide fax or telephone communication, the brother printer MFC-990CW should be connected to the telephone line, for which purpose the device uses an ordinary connector. If needed, some extra telephone sets can be connected to the MFD outlet. The USB and Ethernet connectors are located inside the printer, which seems unusual. After the printer is connected, the cable appears protected from external effects. It cannot be occasionally disconnected or broken. The only inconvenience of such connection is that it shortens the cable. But this problem occurs only in case of USB connection. The MFD's are mostly used for printing (except of some cases, of course). 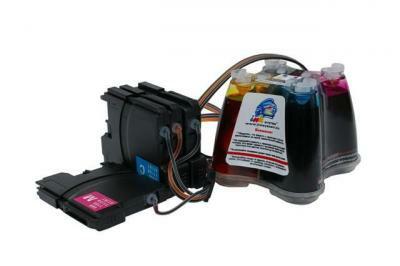 The MFC-990CW Brother multifunctional printer uses classic four-color system with separate cartridges. Although it is not able to reproduce some tints while printing photos, its advantages are simplicity and low price. However, the Manufacturer is doing his best to improve the printing quality. For this purpose the MFC-990CW printer is supplied with Brother Innobella technologies, which use special inks and proper paper. As the device Designers assure, the 1.5 pl drop size makes the prints look like six-color ones. Besides it makes the printing process cheaper (the cartridges are designed to produce 450 monochromatic pages and 325 color pages). All the above mentioned functions separately can be provided by a lot of distributed devices, but their combination create one rather modern integral MFD which is the MFC-990CW Brother. The device was successfully presented at technology expositions which took place in New York, Chicago, Washington, Florida, where it gained high appreciation. Color LCD touch screen 4.2 "